I read a really good book recently, y'all — Bubba Done It by Maggie Toussaint. Let me tell you a little about it. 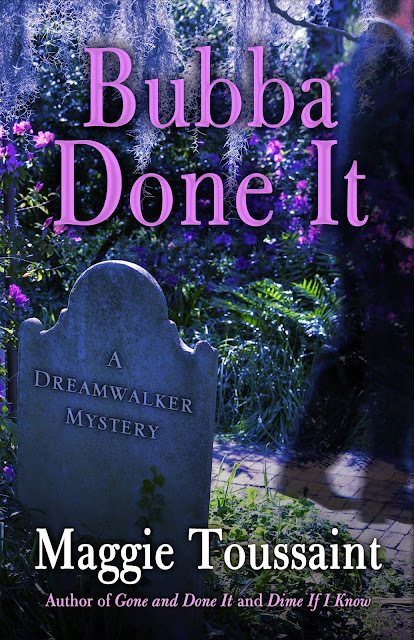 Bubba Done It is the second book in the Dreamwalker Mystery series, following Gone and Done It (reviewed here). Both books star Baxley Powell, who in Bubba Done It is beginning her new position as psychic police consultant, and has embraced her new role as County Dreamwalker. The action of Bubba Done It gets going immediately. The dying man's declaration of his killer, "Bubba done it," occurs at the end of chapter one. Since one of the possible Bubbas is her brother-in-law, Baxley decides to investigate the different Bubbas so she can clear Bubba Powell's name. The more she searches, the more dirt she discovers about the Bubbas — all four of them. Which Bubba done it? READ THE BOOK! There is a secondary mystery — the niece of the murder victim disappeared nine months ago, in an apparent boating accident. The girl, June, was best friends with Baxley's ten year old daughter Larissa. What happened to June? Is it related to her uncle's death? READ THE BOOK! There is also some lively entertainment, when Author Maggie Toussaint writes about the funeral for the murder victim. Would you believe a food fight? At the reception following the funeral? And of course, one of the Bubbas is at the center of it! Want to know more? READ THE BOOK! Baxley narrates Bubba Done It and, with her great sense of humor and snark, makes this a very fun read. It was a very quick read too, because I just had to find out which Bubba done it. I was surprised by whodunit, and loved the ending. I really enjoyed Bubba Done It, and recommend it to fans of cozy mysteries everywhere, especially those who like a touch of paranormal added in. Bubba Done It has earned a rating of Four Kitties! Note: I received a complimentary copy of Bubba Done It in exchange for my honest review. Follow the tour, to read other reviews, plus Author Interviews and Guest Posts! 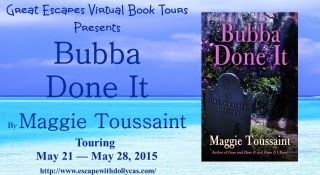 Click here to read an excerpt of Bubba Done It on Author Maggie Toussaint's website. There was a time when the TV show The Twilight Zone scared me out of my gourd. I would have nightmares for days, thinking I saw normal people acting creepy out of the corner of my eye. Fast forward to adulthood, and I wouldn’t even entertain reading a book about vampires, shapeshifters or zombies. To this day, I still don’t like dark, unfamiliar places or tunnels. Then, fate changed my mindset. A popular mystery author’s work became an HBO series, and I began watching True Blood, even though it had, gasp, vampires. Charlaine Harris’ vampires were struggling to fit in to the human world, trying to become mainstream. The elemental struggle of insiders vs outsiders glommed onto my imagination and wouldn’t let go. Sure, I still closed my eyes on the show’s scary parts, but little by little I became more accepting of the storyline and keenly interested in the social dynamics. Vampires, shapeshifters, werewolves, and more had identity issues, fought for power, and learned the hard way to respect their group’s rules. Mind you, I still don’t care for gore for gore’s sake, but I get it now. Generically speaking, people have animalistic natures, we tend to run in packs, we often change our personas to fit in, but there’s no denying who we really are. In addition, most people enjoy a good scare. As time passed and vampires, even sparkly ones, became the rage, as shows like Grimm (one of my favs!) attained high ratings, I rethought my stance on the paranormal world. I wanted to write a paranormal series, but it couldn’t be too scary or I’d walk around with my eyes wide open the rest of my days. What intrigued me? The answer came as soon as I posed the question. The ghost stories I’d heard as a child thrived in my imagination. I’d accepted them as fact when I was little, as fanciful tales as I matured, and yet, through faith and experience, I’d come to realize a lot of life couldn’t be explained. Saints, angels, and miracles for starters. Intangibles like spiritual energy, which people either believed absolutely or outright denied. The paranormal story desire caught fire in my head. Writing about the spirit world and the afterlife appealed to me on many levels. I enjoy world building, and as the sole creator of my Dreamwalker World, the parameters and rules would be mine and mine alone. Since paranormal encompasses the range of everything different from normal, I chose to have my amateur sleuth, Dreamwalker Baxley Powell, experience a new aspect of either the paranormal world or her recently embraced extrasensory powers in each book. 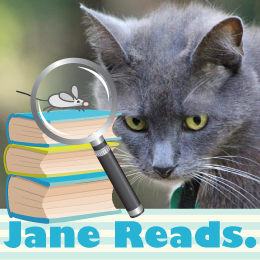 I’m sure other authors use similar considerations, but I was greatly impressed by the skill Charlaine Harris displayed in her Sookie Stackhouse books. She didn’t overwhelm the reader with too many unusual elements in each story. She built Sookie’s world gradually, layering it in a way that seemed credible to fans of her series. That’s my goal, too, building Baxley’s world in digestible layers. The first book in my Dreamwalker Mystery Series, Gone and Done It, introduces readers to Baxley’s spirit world. She learns how to make the transition between worlds and what the rules are, making rookie mistakes along the way. Since Baxley is a reluctant sleuth, she employs her extrasensory abilities only as she needs them. My latest book in the series, Bubba Done It, propels Baxley past a scary place, which she willingly does to protect her daughter. Talent is inherited, after all. Baxley got hers from her father, and it appears her daughter has the family extrasensory abilities. In addition to crime solving, Baxley, like any good parent, strives for normalcy for her daughter in a world gone crazy. I still watch scary movies with my hands over my eyes (or a blanket over my head, LOL), but I hope you’ll follow us into Baxley’s world. There are scary situations, misbehaving people and spirits, a Southern setting, humor, and a mom providing for her family using her natural talents. Oh, and did I mention Baxley’s got weird hair? The white forelock is an aspect of her burgeoning talent, a tangible sign that boldly proclaims her as a woman of power. So, while wrestling with human and supernatural baddies, Baxley also has the very human challenge of every day being a bad hair day. Come cheer her on in Bubba Done It!